Grandparents, parents, and children living in one household present unique challenges and benefits to caregivers. 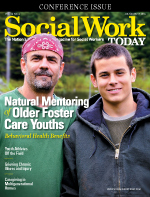 Social workers can help navigate the rough spots. In one corner, a set of twin toddlers cries in tandem, hungry for food and affection. After a long day, they’re worn out and eager for their mother’s return. At the same time, an older woman moves frantically around the kitchen, struggling to put dinner on the table. Against a backdrop of clanging metal pots and pans, she sings sweetly to the twins, hoping to soothe their frustration as well as her own. She, too, anticipates her daughter’s return, as it’s late in the day and time to take her medication. From a busy office, Carol returns to a bustling home, wanting nothing more than to prop up her feet and rest her head—if only for a few minutes. But on entering the kitchen, she sees three sets of eyes light up, all waiting to get her attention. “It’s going to be a long night,” Carol mutters under her breath as she takes off her coat and puts on her best smile. Multigenerational households are at the forefront of American society now more than ever before. For many caregivers, coming home to a spouse and children has its challenges yet is nonetheless considered standard in most traditional households. Pair those challenges with the ones that come with having an elder parent in the home or an adult child with special needs, and the dynamic changes entirely. With 90 million caregivers across the country, four in 10 families are experiencing this reality daily. “When it comes to caregiving, multigenerational homes come in all shapes and sizes with combinations included,” says Lenard W. Kaye, DSW, PhD, director of the UMaine Center on Aging and a professor in the University of Maine School of Social Work. In his research, he has found as many as four generations living under the same roof. According to John Schall, MPP, CEO of Caregiver Action Network in Washington DC, “A good example of this kind of household is when someone with Alzheimer’s disease moves into the family’s home to be cared for.” He says a growing number of these types of households are found in cultural populations, such as within Hispanic families. On the opposite side of the spectrum, Marianne Nicolosi, LMSW, executive director of the Bay Ridge Center in Brooklyn, NY, has encountered multigenerational households where the caregivers managed their younger disabled adult children within the home. Multigenerational households are complex and come with an array of challenges. Deborah Langosch, PhD, LCSW, project director of the kinship care program for the Jewish Board of Family and Children’s Services in New York, has worked with parents who experienced difficulty parenting due to mental illness, substance abuse, homelessness, poverty, divorce, or a combination of these factors. Moving in with their children’s grandparents became the best solution for them at the time, though the outcome often was unexpected. On one hand, it provided a roof over their heads and some stability in their lives, but on the other hand, it created unanticipated issues around boundaries. “The question of who had authority within the family and who made decisions over the children arose,” Langosch explains. When disagreements occurred, the children were confused about who to listen to and thus the loyalty to parent vs. grandparent changed because of differences of opinion. Due to a lack of problem-solving skills, these families faced greater stress and conflicts. Nicolosi says the drawbacks to such living arrangement primarily are related to the extreme limitations placed on a person’s own life while caring for another person. “Families face challenges of balancing everyone’s needs against the greater need of the affected individual who is becoming more dependent,” she notes. Jendrek’s findings support this, and she says there are several challenges that arise in legal, social, employment, and custody arenas. For example, how does a grandparent obtain health insurance or school enrollment without having legal custody of a grandchild? How does someone entertain friends who are in their 50s, 60s, and 70s with a young child at the table? Do grandparents need to put off retirement plans because their grandchild needs to go to college? Can they even retire? Should a grandparent pursue custody when doing so implies that his or her own child is an unfit parent? For many families, these are painful and difficult decisions to make. Some grandparents, although thoroughly enjoying the experience of being with their grandchildren, also complain of exhaustion. At this stage in their lives, they were hoping to have time for their personal interests, such as travelling or engaging in volunteer work. Much to their dismay, they feel as though they’re being held back by childcare demands that leave them stressed and depleted, Jendrek says. Then there are the medical implications that caregivers must consider. In his work with multigenerational families, Schall found that medication safety becomes an important focus. If there are three generations in the house, and the older person takes pain medication for his or her condition, he or she needs to be careful in keeping the medication out of children’s reach. This applies both to unsuspecting youngsters who may rummage through cabinets and teenagers or their friends who want to use the medication recreationally. There’s a fair amount of abuse that could happen if the medications get into the wrong hands, Schall says. In spite of these complex challenges, Schall describes the benefits of multigenerational households as both “numerous and extremely enriching.” When the youngest and oldest generations both are present, the grandchildren get to know their grandparents closely rather than being separated from them at this stage of their lives. Young and old still can share experiences and draw from each other, he says. What’s especially helpful is when household tasks and chores can be shared. With more hands on deck, the overall caregiver burden no longer trickles down to one or two individuals. Schall has seen grandparents step forward and help take care of the grandchild in order to give their children an opportunity to return to work or take off an hour or two to get some respite. Although the setup may not always be ideal, a working parent with long hours often can rely on the grandparents to provide childcare and supervision when needed. This is both practical and financially feasible for many families and can offer tremendous relief to a parent who’s otherwise overwhelmed with feeding schedules, day-care pickups, and after-school activities. Furthermore, it can be a relief to know that a child is left in the hands of a family member who has been down that road before. Kaye says that millions of “grandfamilies” exist across the country where grandparents take the leading role in their grandchildren’s lives. He says these grandparents have “been there, done that, and are now doing it again” and considers them the unsung heroes in many respects. According to Langosch, a multigenerational home can provide a family with safety, security, and stability in many ways. If the option of a parent or grandparent wasn’t available, many of these children would end up in foster care or worse. Keeping the family together strengthens family values and preserves culture and tradition while retaining the history that’s an integral part of the child’s life, she says. A growing body of attitude change concerning men has been recognized within multigenerational households. “Although a lion’s share of caregiving tasks are taken over by women, we are seeing husbands and sons stepping forward in increasing numbers and doing all sorts of things that enable their wives and parents to age, and even thrive, in place,” Kaye says. A new trend has emerged in their willingness to help out, and Kaye’s research reveals that men have felt transformed by this experience. Taking on this role released their kinder, gentler sides, and they discovered they were capable of caring, helping, and making a difference in someone else’s life. In addition, they learned how to cook, manage finances, and become educated shoppers, which in the past had been taken on by the female members in the household. These men felt that they reached a higher purpose by giving back, making their relationships truly reciprocal. “A caring man is not an oxymoron,” Kaye notes. In his work with Alzheimer’s disease, Schall has found that mixing generations had a surprising effect. Although grandparents with this disease experienced memory loss, they could naturally connect with their young grandchildren through memory puzzles and sing-alongs. Due to the cognitive limitations of both, grandparent and grandchild could enjoy activities together, which especially was beneficial to the middle-aged parent who could not easily bond with an 80-year-old in this manner. According to Nicolosi, another benefit of this group dynamic includes learning about the dignity of growing old with family around to help. Since all generations learn the power of cooperation, love, and problem solving, this creates good feelings among all. It also allows family members to feel strong and empowered while being valued and cared for. Hunt also believes that all levels of caregivers need to be fully informed and involved in health care decision making. In most cases, the patient himself will have a one-on-one conversation with his medical provider, but Hunt believes there needs to be a triad involving the primary care physician, the patient, and the caregiver so that all parties can share this responsibility. This particularly is important when the caregiver needs to ensure compliance with medication. • Recognition: Langosch believes that “some recognition of the complexity of roles and boundaries in a situation like this” is necessary. Social workers should take the opportunity to validate the hard work that families are doing and outline the strengths that each family member brings. When a caregiver feels supported and recognized, their role within the family becomes more approachable and rewarding. • Education: Families risk entering crisis mode when they’re not prepared for what’s about to come. To ease the blow, Schall recommends sharing knowledge within the family. This particularly is important for small children who may not know how to react to their grandparents’ illnesses. He believes it’s vital for children to know what’s going on so they aren’t surprised or confused by it. “If you pretend that everything is going normally in the house, that is a mistake. If Grandma becomes forgetful, the child can get scared by the behavior,” Schall says. At the same time, it’s invaluable to let children know to watch for odd behaviors of their loved ones so they can anticipate issues such as falls, problems with medications, or wandering. “It helps having multiple informed sets of eyes,” Schall notes. “Most caregivers aren’t looking to get out of the responsibility, but they simply need breaks periodically and the opportunity to take care of themselves,” Kane adds. Social workers can use this occasion to point them in the direction of community resources, such as alternative living situations, adult day centers, long term care options, babysitting services, home health care, and other forms of respite care. Langosch calls social workers the bridge that guides families to entitlements they never knew about. In multigenerational households, a social worker can be the family’s ticket to a happy, healthy home. In Schall’s experience, families won’t think of many of the services of which social workers are well aware. He believes that social workers are the saving grace in these situations, as they understand the caregiver standpoint and provide care in ways physicians can’t or don’t. Social workers pick up the slack, he says. With everyone working together, multigenerational families can be feel empowered by their living situation and can approach the future with confidence, self-assurance and, perhaps most importantly, some peace of mind. — Susan London, LMSW, is a freelance writer based in Brooklyn, NY, and the program director for Heart to Heart social adult day services in Crown Heights, Brooklyn.